Open lunch and dinner every day. Until 10pm on weeknights and 11pm on Friday and Saturday. With the closing of Blue Nile in the north campus area, Ethiopian food had become an east side affair. 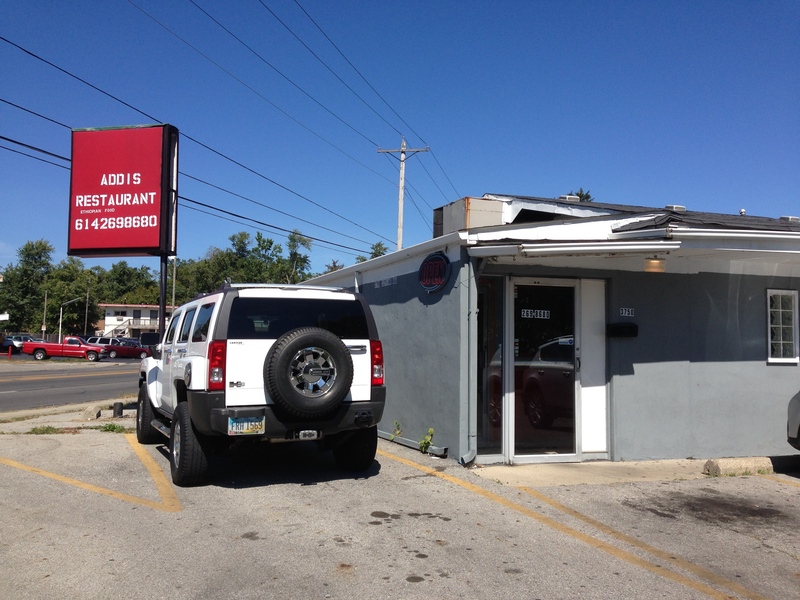 And, while we like Ethiopian food, we haven’t craved it enough to schlepp out to Hamilton Rd. with any regularity. The owner Niman knew that a larger proportion of the Ethiopian and Eritrean population were on the North side, unserved by a restaurant offering their national cuisine, and with the opening of his Cleveland Avenue restaurant, Addis, he has made the cuisine far more geographically accessible for them, and for us. The dining room is clean and pleasant, in an orderly no-frills kind of way, and service is unwaveringly pleasant and eager to answer questions. The menu is tightly focused, with less than 10 dishes, though 10 more are understood to be on their way in the next couple of weeks. While we’re eager to see what the menu expansion may bring, we were more than happy with what exists. 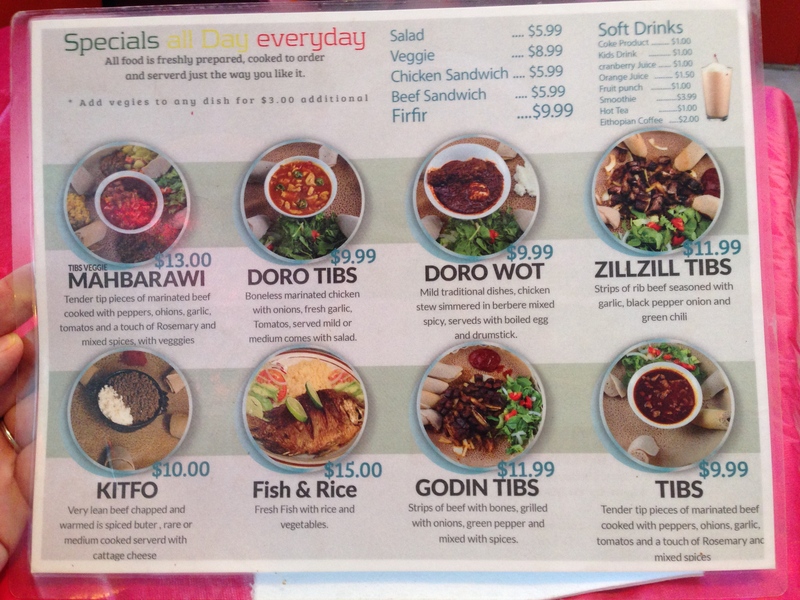 We tried the mahbarawi platter with tibs, and added the zillzill tibs, a beef short rib dish. The mahbarawi platter also included 4 vegetable dishes and salad. All of the dishes are served together on a larger sharing platter with some hot sauce. The tibs, a beef stew was, to us, the best rendition we’ve tried so far – spicy, complex, and delicious. The platter can also be ordered with chicken. The zillzill tibs, on the other hand, was entirely new to us, and amounted to a tasty curiosity. It consisted of chunks of beef short rib meat, and the menu listed it as seasoned with garlic, black pepper, onion, and green chili. True though this may be, the flavor struck us as faintly teriyaki-esque… which was not bad, by any means, but more than a bit surprising. Accompaniments included lentils, cabbage, and spinach, and all were up to snuff. The injera bread as good as any we’ve had, and was conspicuously fresh. Portions, as always with Ethiopian food are plentiful. Dishes are cooked to order and Niman was keen to point out that dishes like kitfo can be cooked to your taste – anywhere from rare to well done. We were also asked what level of spice we wanted. As is traditional with Ethiopian food be prepared to eat with your hands. We also enjoyed Ethiopian tea and coffee and Niman told us that on Friday they prepare traditionally prepared Ethiopian coffee and offer samples to customers. 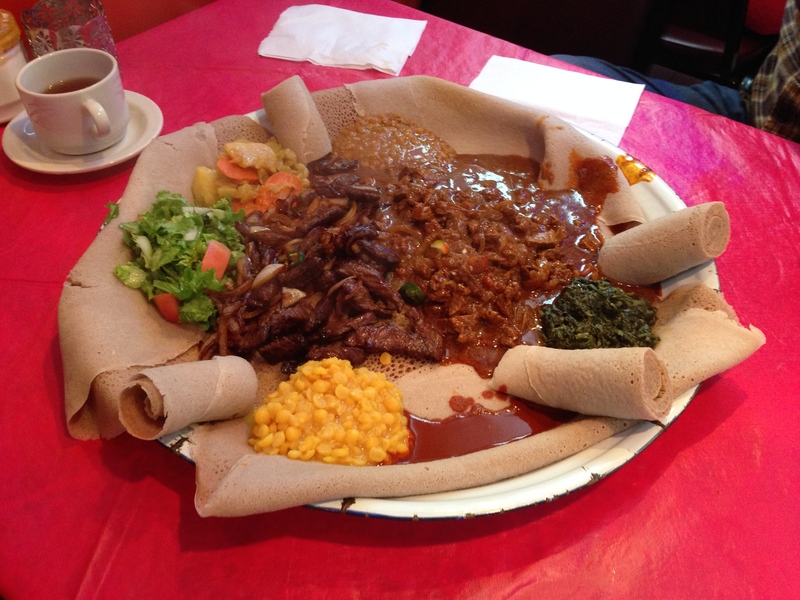 This entry was posted in African, Ethiopian and tagged injera. Bookmark the permalink. I’ve just discovered your website and love it! On the strength of your recommendation, my friend and I are in transit to visit Addi’s. We love trying new and unusual foods. I think your site is going to be a great tool for us. Thank you! This is an excellent Ethiopian restaurant! Everything my dining partner and I tried here thus far was prepared flawlessly. We especially liked that we could name our spiciness level which ended up being equal to a level 4 or 5 at Westgate Thai…a significant difference from most Ethiopian/Somali (or any other) joints. This fact alone increased the enjoyment of the meal and guarantees many return visits. Addis doesn’t give you as many rolls of injera upfront like Lalibela, but it was enough to sop up all the gravy for two platters.